This look was soooo simple it's almost embarrassing. It's also appropriate for work and school, but still eye-catching without being too much. 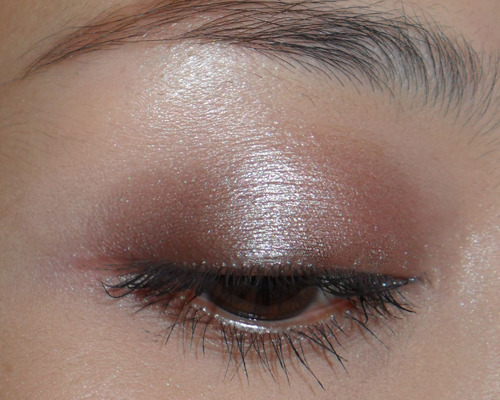 A dark brown shadow for your lashline and outer half of crease. A soft metallic neutral beige-brown (e.g. below) that's - here's the important bit - a little deeper than your skin color, but very high-shine. 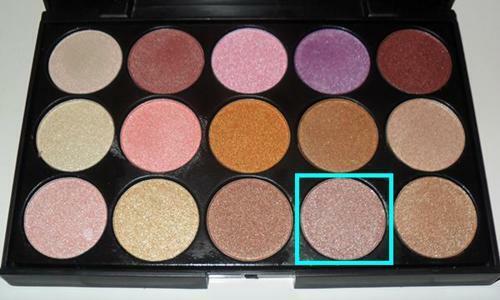 This goes all over the inner 2/3 of your lids up to the socket, and on your brow bone. As you look at it in the pan, the tone should be a little deeper than your foundation shade. But when it catches the light, it should be much lighter. The shadow should be translucent rather than chalky and opaque. This type of color will be able to multi-function as highlight AND shading color, and can help emphasize bone structure with minimal effort and skill. For more makeup tutorials, looks and giveaways, visit my main blog at makeupbox.tumblr.com!